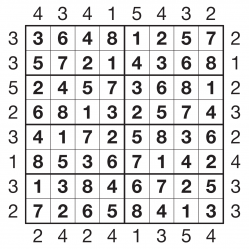 Skyscraper puzzles feature a square grid which, like Sudoku, must have every internal row and column filled with one of each digit. 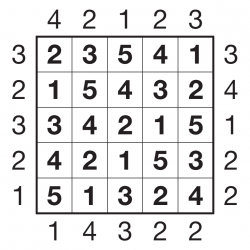 In a 1-6 puzzle, for example, every digit from 1 to 6 must occur in each row and column. 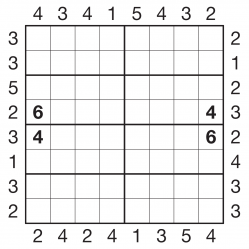 Unlike Sudoku, however, there are also exterior 'skyscraper' clues. 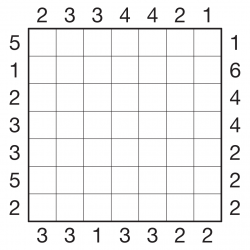 Each digit placed in the grid can be imagined as a building of that many storeys, so for example a '3' would be a 3-storey building. Every given number outside the grid reveals the number of 'buildings' that can be seen from that point, looking along the adjacent row or column. Every building blocks all buildings of a lower height from view, while taller buildings are still visible beyond it. For example, if you look along a row and see "1 2 3 4 5 6" then the clue at the start of the row would be 6, since no building obscures any other. If instead you looked along and saw "1 3 4 5 6 2" then the clue would be 5, since 5 buildings can be seen (the 6 obscures the 2). 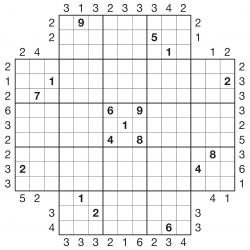 Every puzzle has a unique solution that can be reached using only reasonable logical deduction. If you're a Sudoku expert you'll definitely find that some of your skills come in handy with Skyscraper too! 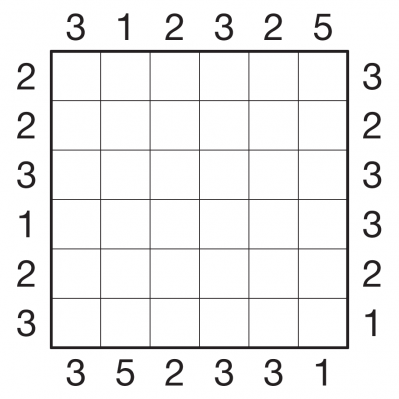 As the examples on the right show, Skyscraper puzzles can be combined with Sudoku regions, including in large Samurai versions of arbitrary shapes. We can also make a wide range of other variants and combinations.